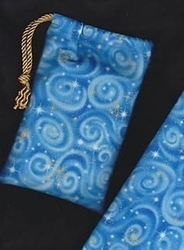 What would it look like if you could see the loops and swirls of energy pouring off your magick wand? A lot like this bag! 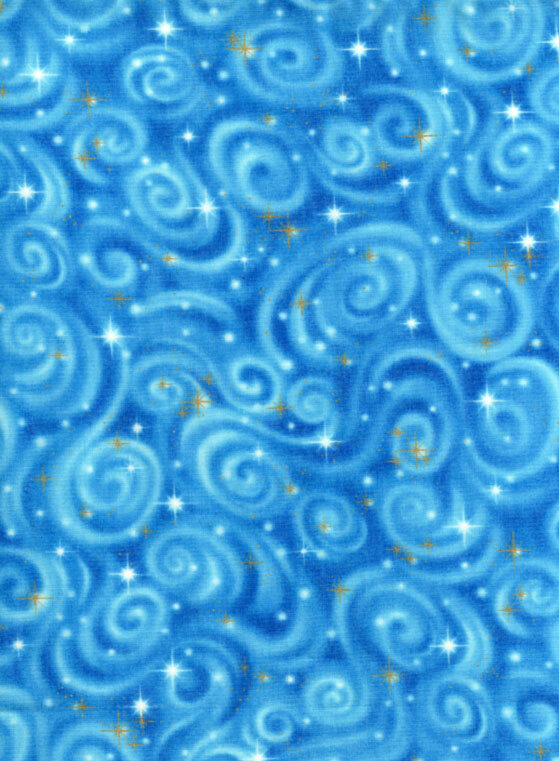 Creamy loops and pale blue swirls, dotted with white and metallic gold stars, create a magickal pattern. 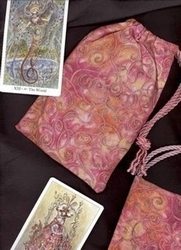 Add a bit of wizardly magic to your next reading with this White Magick Tarot Bag. This bag coordinates well with almost any tarot deck. 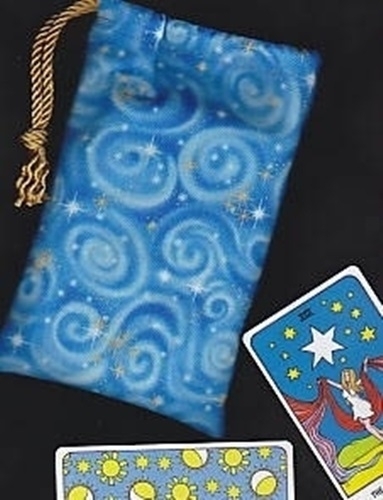 As you can see in the photo, it looks especially nice with the Tell Me Tarot. 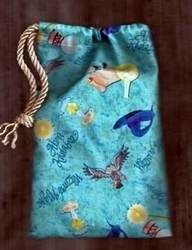 Also available as a Reading / Altar Cloth or Bag & Cloth Set. Wands Symbolism: The wand as a symbol of magic has its origins in ancient symbolic language. Wands and rods have long represented divine power, royalty, and spirituality. From early Judeo-Christian religious traditions to modern pop culture in Harry Potter, wands have been recognized as an extension of one's willpower. Because they are usually carved from the branch of a tree, wands are specifically related to natural power and magic. 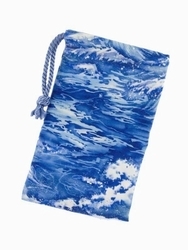 Size: Measures approximately 5" wide by 7-3/4" to 8" inches tall (12.7 x 19.7 cm). Fits most standard tarot card decks (3" x 5" and smaller). Design: Our single draw bags are a classic choice, great for when you're on the go. All seams are triple stitched and the drawstring opening is reinforced. See our Quality page for more details about construction. All of our bags are individually handcrafted with care to ensure quality. Please allow for slight, natural variations in size and pattern placement. All of our cloth and silk products are individually handcrafted with care to ensure quality. Please allow for slight, natural variations in size and pattern placement. Note on images: Due to variances among color monitors, the colors on your screen may appear differently than the actual product.